My wife found an image in a magazine of a girl dancing wearing a really elegant dress and suggested that it would be a good idea for a painting. I did my own spin on the dress adding red, yellow, yellow-green and blue. While painting the back ground I went a little to heavy with the water and got drips. After they dried they looked really neat so I left them in and traced them to define them more. I’m learning more and more to let the painting become something naturally instead of forcing it to fit an exact idea. Art is all about discovery. 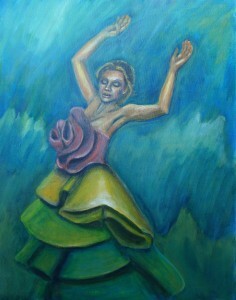 So this painting is all about rain, life, flowers and dancing. I personally love the rain… and am hoping nor-cal gets some more soon!